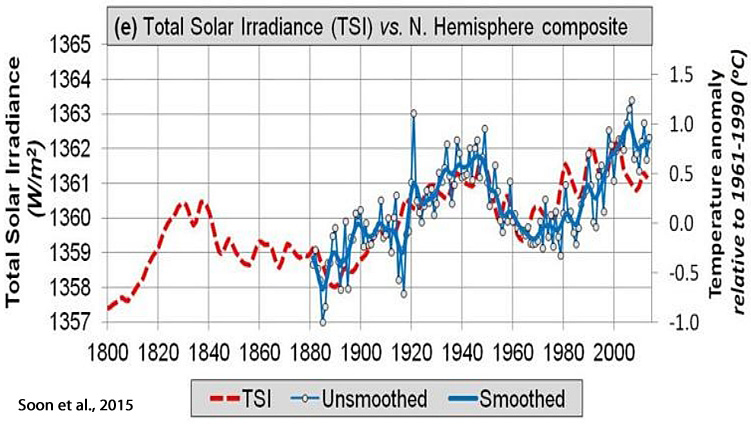 Here is the correlation between CO2 and Annual Mean Temperature followed by the correlation between Total Solar Irradiance and temperature. 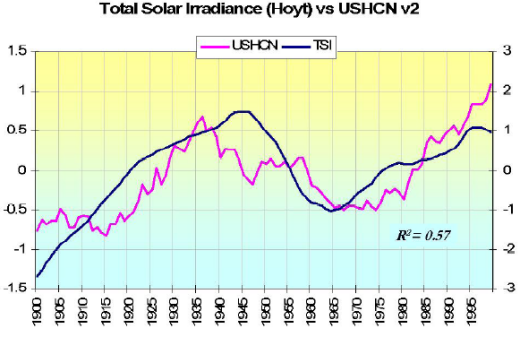 Solar correlates better than CO2 as a drive of climate! 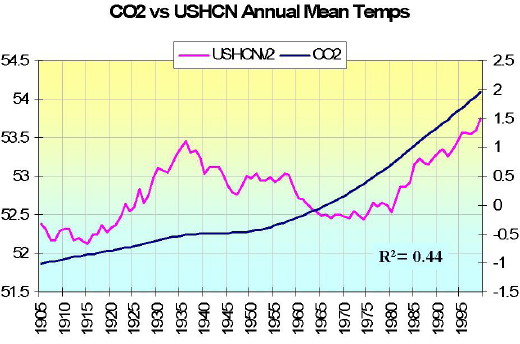 Clearly the US annual temperatures over the last century have correlated far better with cycles in the sun and oceans than carbon dioxide. The correlation with carbon dioxide seems to have vanished or even reversed in the last decade. Given the recent cooling of the Pacific and Atlantic and rapid decline in solar activity, we might anticipate given these correlations, temperatures to accelerate downwards shortly. over 100 potential solar amplification mechanisms described in the literature. and without any consideration of any greenhouse gas concentrations or 'radiative forcing' from greenhouse gases whatsoever. Thus, the paper adds to the works of at least 40 others (partial list below) who have falsified the Arrhenius radiative theory of catastrophic global warming from increased levels of CO2, and also thereby demonstrated that the Maxwell/Clausius/Carnot/Boltzmann/Feynman atmospheric mass/gravity/pressure greenhouse theory is instead the correct explanation of the 33C greenhouse effect on Earth, and which is independent of "radiative forcing" from greenhouse gases. "apply the Dimensional Analysis (DA) methodology to a well-constrained data set of six celestial bodies representing highly diverse physical environments in the solar system, i.e. Venus, Earth, the Moon, Mars, Titan (a moon of Saturn), and Triton (a moon of Neptune). Twelve prospective relationships (models) suggested by DA are investigated via non-linear regression analyses involving dimensionless products comprised of solar irradiance, greenhouse-gas partial pressure/density and total atmospheric pressure/density as forcing variables, and two temperature ratios as dependent (state) variables. One non-linear regression model is found to statistically outperform the rest by a wide margin. Our analysis revealed that GMATs [Global Mean Atmospheric Temperatures] of rocky planets can accurately be predicted over a broad range of atmospheric conditions [0% to over 96% greenhouse gases] and radiative regimes only using two forcing variables: top-of-the-atmosphere solar irradiance and total surface atmospheric pressure [a function of atmospheric mass & gravity]. The new model displays characteristics of an emergent macro-level thermodynamic relationship heretofore unbeknown to science that deserves further investigation and possibly a theoretical interpretation." “Completely False And Was Deliberately Manufactured”! In late 2015, Soon, Connolly, and Connolly (hereafter SCC15) published a comprehensive (101 pages) analysis of how the modern anthropogenic global warming (AGW) paradigm has been constructed. The paper, published in Earth Science Reviews, is entitled Re-evaluating the role of solar variability on Northern Hemisphere temperature trends since the 19th century. “...most of the temperature trends since at least 1881 can be explained in terms of solar variability, with atmospheric greenhouse gas concentrations providing at most a minor contribution. What follows is a very brief summary of some of the graphical highlights in SCC15 as well as the fully cited conclusion. Succinctly, the paper can be divided into 2 parts. 1. The instrumental temperature record has undergone heavy adjustments (a utilization of an urban temperature station siting bias) to allow a better fit with climate models that presume CO2 emissions drive temperature. 2.. CO2-based climate models do not adequately correlate with Northern Hemisphere (NH) temperature trends of the last 130 years; solar activity changes do correlate well with NH trends — especially when urban bias has been removed from the temperature record.